But why? 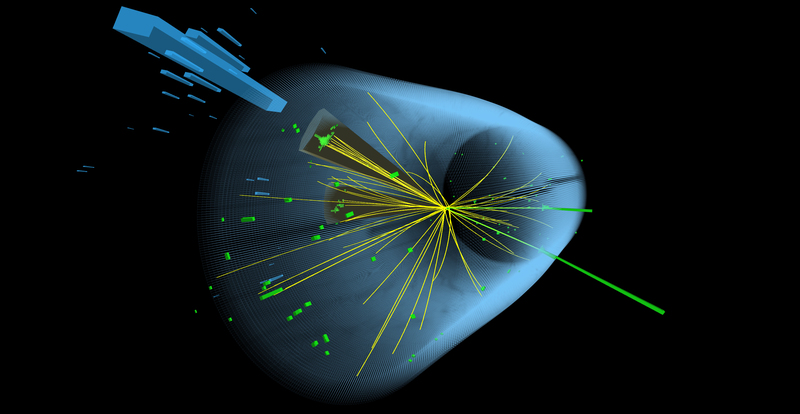 “Why should the universe decide to have this Higgs presence all over? That is a big, big question,” said Michelangelo Mangano, a particle theorist at CERN, the laboratory that houses the LHC. Physicists wonder whether the Higgs symmetry-breaking event had a role in creating the universe’s matter-antimatter asymmetry — the unexplained fact that so much more matter exists than antimatter. Another question is whether the Higgs field’s current value is stable or could suddenly change again — an unsettling prospect known as “vacuum decay.” The value of the Higgs field can be thought of as a ball settled at the bottom of a valley. The question is, are there yet deeper valleys in the mathematical curve that defines the field’s possible values? If so, the ball will eventually tunnel to the lower, more stable valley, corresponding to a drop in the energy of the Higgs field. A bubble of the more stable “true vacuum” would grow and encompass the “false vacuum” that we’ve been living in, obliterating everything. Not only is the Higgs field tied to the origin and fate of the universe, but the Higgs particle’s behavior can also reveal hidden or otherwise unknown particles that it interacts with — perhaps those that make up the cosmos’s missing dark matter. In a particle collider, when particles smash together at nearly light speed, their kinetic energy converts into matter, occasionally forming heavy particles such as the Higgs boson. This Higgs then quickly morphs into other particles, such as a pair of top quarks or W bosons, where the probability of each outcome depends on the strength of the Higgs’ coupling to each type of particle. Precisely measuring the probabilities of these different Higgs decays and comparing the numbers to Standard Model predictions reveal if anything is missing, since the probabilities must add up to one. That’s one reason she and many of her colleagues want to build a bigger, better machine. The first phase of the proposed supercollider has been nicknamed the “Higgs factory,” because the machine would collide electrons and positrons with energies precisely tuned to maximize their chance of yielding Higgs bosons, whose subsequent decays could be measured in detail. In phase two, the giant machine would slam together protons, resulting in messier but much more energetic collisions. Perhaps the most important coupling that physicists want to nail down is called the triple Higgs coupling — essentially the strength of the Higgs boson’s interaction with itself. This number is measured by counting rare events, not yet seen at the LHC, in which a Higgs boson decays into two of itself. The Standard Model makes a prediction for the value of the triple Higgs coupling, so any measured deviations from this prediction would signify the existence of new particles not included in the Standard Model that affect the Higgs. Measuring the triple Higgs coupling would also reveal the shape of the mathematical curve that defines the Higgs field’s different possible values, helping to determine whether the vacuum of our universe is stable or only metastable — settled in a local rather than a global minimum of the curve. If the Standard Model’s prediction for the coupling is correct, then the universe is metastable, destined to decay billions or trillions of years from now. This is nothing to worry about, but rather an important clue about the larger story of our cosmos. The ability to reveal the universe’s fate is why the triple Higgs coupling “is at the heart of the experimental program at the future colliders,” said Cédric Weiland, a particle physicist at the University of Pittsburgh who has studied this coupling. With a Higgs factory, Weiland said, physicists could measure the triple Higgs coupling with a precision of 44 percent. The second-phase proton-proton collider could nail its value to within 5 percent. The baseline expectation is that measurements at a future collider will simply confirm the Standard Model, which seems frustratingly unbreakable even as it gives an incomplete account of the physical universe. Some physicists balk at the prospect of investing billions of dollars in a machine that might simply add more decimal places of precision to our knowledge of an existing set of equations. Physicists and funding agencies will actively debate the value of an LHC successor over the next few years. Whether to spend 20 years and as many billions of dollars constructing a 100-kilometer-circumference collider hinges on its discovery potential. Past colliders struck upon the puzzle pieces of the Standard Model one by one. But with that puzzle complete, there’s no guarantee that a future machine will find anything new, leaving physicists with a dilemma: to build or not to build? Esta entrada se ha publicado en Artículo, Cosas Nuevas, Efectos Secundarios, Investigaciones, Sabías que, Tecnología, Vale la pena ver y se ha etiquetado como asimetría, colisión, cosmos, electrón, espacio, evento, física, generación masiva, masa, materia, origen, partículas, universo, vacío. Marca el vínculo permanente.